This is The Story of a Happy Marriage (or How a Book Club Was Born). Way back in May, which seems like forever ago now, back when the kids were still in school, back when days were warm and nights were cool, you get my drift… Way back in May, I was in the library with my friend Rachel and our kids. I spied a book on a bookcase across the room and decided I wanted to read it. I’d heard of the book before, and I was definitely judging this book by its cover, knowing nothing about it. I decided on the spot to have a summer book club for us moms who were staring down a long summer with the kids in town. That evening, I sent out an email to a group of friends who I thought would be down with a book club and who would be in town most of the summer. Every single lady said yes, god bless ’em. This book club would be on! 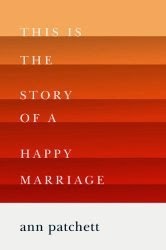 The book: This Is The Story of a Happy Marriage, by Ann Patchett. I had no idea what the book was about but I trusted my instincts. It turned out to be a collection of personal essays, wonderful personal essays, maybe the best I’ve ever read. Before the book was even done, I knew I’d re-read it. I did have some pangs of worry though because these personal essays were also essays about writing, and I wasn’t sure if the ladies in my group would be down that. I guess I had thought the essays would be about marriage and parenting and being a woman, and all that good stuff. First of all, Patchett has no children so there are no essays about motherhood, though she does write about her consternation towards people who assume that she is using her dog as sublimation for a baby. Art stands on the shoulders of craft, which means that to get to the art you must master the craft. If you want to write, practice writing. Practice it for hours a day, not to come up with a story you can publish, but because you long to learn how to write well, because there is something that you alone can say. Write the story, learn from it, put it away, write another story. Think of a sink pipe filled with sticky sediment. The only way to get clean water is to force a small ocean through the tap. Most of us are full up with bad stories, boring stories, self-indulgent stories, searing works of unendurable melodrama We must get all of them out of system in order to find the good stories that may or may not exist in the freshwater underneath. Besides the wonderful, writerly advice, Patchett’s essays give us an glimpse into worlds we don’t see, sometimes risking an unpopular viewpoint. In The Wall, Patchett writes about trying out for the Los Angeles Police Academy, in the aftermath of the Rodney King riots. Patchett’s father was a captain in the LAPD, and retired before the riots. Her experience with the officers of the LAPD stands in stark contrast with the media portrayal of the force following the beating of Rodney King, his trial and the riots. In this essay, she strives to put a face on an oft-villanized group. While she does not attempt to excuse or apologize for the officers that beat Rodney King, she does want to reclaim her hard-working father’s honor and who can fault a daughter for that? I am proud of my father. I am proud of his life’s work. For a brief time I saw how difficult it would be to be a police officer in the city of Los Angeles, how easy it would be to fail at the job, as so many have failed. My father succeeded. He served his city well. I wanted to make a note of that. Out of respect for Patchett, I am not including my Amazon affiliate link here. I bought my copy at my local independent bookseller and I urge you to do the same. Full disclosure: Though I have an Amazon affiliate account, I do usually buy my books at my local bookstore. Now you know my dirty secret. Next Post The Original is Always Better.